Like most people of my generation I've done my fair share of temp work. Call centres, shelf stacking, data entry, administration and filing... all tedious and soul destroying jobs that I would never have imagined could result in an enjoyable and addictive game design. 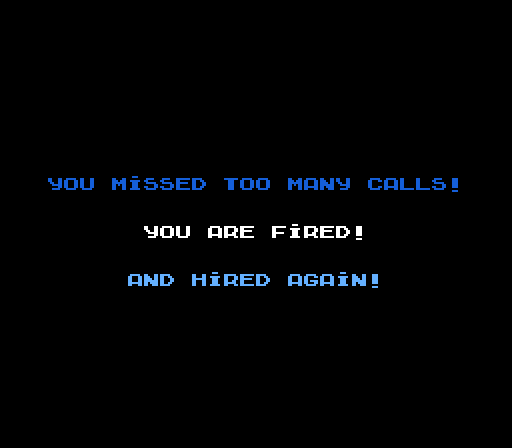 However, Shiru and PinWizz have somehow taken the combination of phone answering, filing and a variety of office stereotypes and lovingly moulded them in to an excellent arcade title for the NES/Famicom. Underpaid and overworked office minions of the world, Zooming Secretary is a game written for you. Shiru (who is also responsible for coding the Genesis/Megadrive port of UWOL in addition to several other commercial-quality homebrew NES games) mentioned to me a few months back that he was involved in a new collaborative NES game project, but even with knowledge of his previous work I never expected anything quite as brilliant as Zooming Secretary. Part platformer, part puzzle, part workplace simulator and entirely satirical, the design is original and modern yet fits perfectly at home with the existing library of classic 1980's family-friendly NES games. Playing the role of a secretary in her trial period at a new job, you have to work your way through an increasingly difficult week without being fired for failing to answer calls on time. Each single screen level (wrapping on both horizontal and vertical axes) consists of an arrangement of platforms and staircases upon which are placed a number of phones and filing cabinets. When a phone rings, the topic that the call is about is represented by a symbol above the handset - and your task is to run to the matching filing cabinet then answer the call before the phone rings off. It starts of simple enough, with day one based on a symmetrical level with only two phones and two cabinets, but the difficulty soon ramps up with devious platform placement and a variety of obstructive NPC's thrown into the mix. The boss slows you down with his unhelpful remarks (just like in real life) and chatting with the office gossip-girl can leave you confused and swap over the topic currently held in your single-track mind. Then there's the delivery guy knocking people over and the oh-so-essential and distracting office romance - although thankfully there is also a coffee machine to provide you with a caffeine-fuelled speed boost to help you overcome all these obstacles. It's a simple yet compulsive concept that would work equally well as a browser-based casual game or modern console indie title, so to see Zooming Secretary make it's debut on the original 'family computer' is particularly exciting. Regardless of the solid design, it's the presentation of Zooming Secretary that really makes it special. PinWizz's graphics are full of character and charm, and the minimal background music and varied sound effects give the game a more authentic and tense atmosphere than any in-game music module ever could. 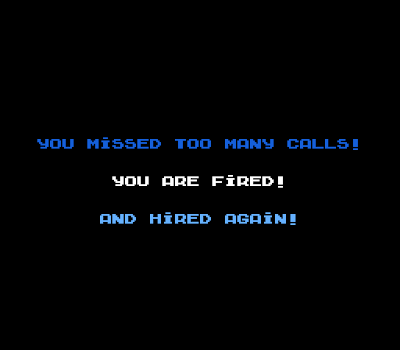 The little general knowledge factoids displayed on the top of the screen as you answer calls may well add to the nostalgic edutainment feel of the game, but it's the game over "you're fired... and rehired" message that brings a smile to my face every time - if only the real world office environment was so kind. Add to this the comprehensive .pdf manual, labels for both NES and Famicom cartridges (should you wish to make your own) and freely downloadable source code, Zooming Secretary is a perfect retro gaming package. 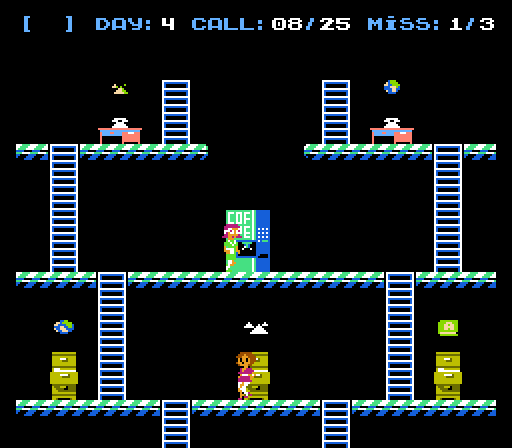 As with Shiru's last NES release - a port of the excellent ZX Spectrum (and now PC) game Alter Ego - the only complaint I have is that Zooming Secretary is a little too short. With just eight levels in total the game holds limited replay value, and the absence of lives and it's addictive gameplay means that with a bit of determination it isn't too hard to work your way through the game in one sitting. However, this doesn't detract from it being one of the best and most original modern NES games that I've played in years. I cannot wait to see what Shiru delivers next. Download Zooming Secretary here (from the Shiru's website). I got fired on 4th day!